Our departure day finally came! After all our preparations for the trip, we boarded the plane en route to Israel. The majority of this group are from Washington state. Flying first from Seattle to Franfurt, and then arriving at the Ben Gurion Airport in Tel Aviv, Israel, we were greeted by Dr. John (our tour leader) and Shlomo (our Israeli guide) as we exited from the customs / baggage area. Boarding our bus (driven by David), we made a stop in Jaffa (Joppa). Here we recalled the stories of Jonah (Jonah 1), and Peter (Acs 9 & 10) as we walked through the quaint alleyways of Jaffa. The view of the Tel Aviv coastline was beautiful! From here we drove through the typical “Tel Aviv traffic” to Netanya. Locate north of Tel Aviv right on the coast of the Med Sea, we checked in, refreshened up, and enjoyed an amazing dinner together. Following dinner we gathered for an orientation meeting as we prepare ourselves for our first full day tomorrow! It is so good to be in Israel, the land of the Bible. Today was our first full day here in Israel, and it was a great one! The weather was very comfortable, with sun and clouds and highs in the 70s. After a wonderful breakfast, we loaded the luggage and departed the hotel here in Netanya around 7:45. As what will become our usual way to start each day, we began our drive to our first site with Scripture and a song (“Oh, the Sun’s Coming Up”). After a 20 minute drive northward along the Med Sea, we arrived at Caesarea. This was a port city built by Herod the Great, a projected that lasted 12 years (22-10 BC). After watching a brief movie about the history of Caesarea, we sat in the theater and read from Acts 10, 12, and 26. Both Peter and Paul boldly proclaimed their faith and testimony here. Leaving the theater, we also saw many marble and granite pillars, the palace, the hippodrome, many mosaics, and the harbor area. We left the site through an impressive Crusader gate dating to the 12thcentury AD. Additionally, seeing the aquaduct (that transported water from the Mt. Carmel Range) was quite impressive as well. Driving from the Coastal Plains to the Mt. Carmel Range, we drove to the top of this mountain range called Muhraqa (“burnt offering”). This is a Carmelite chapel preserving the story of Elijah. We read from 1 Kings 18 and sang a few songs celebrating God’s awesomeness and grace. The view from the rooftop of the chapel provided our first perspective of the Jezreel Valley below. From here we could see many stories from the Old Testament unfold (Mt. Tabor, Judges 4-5; Hill of Moreh, Judges 6-7; Mt. 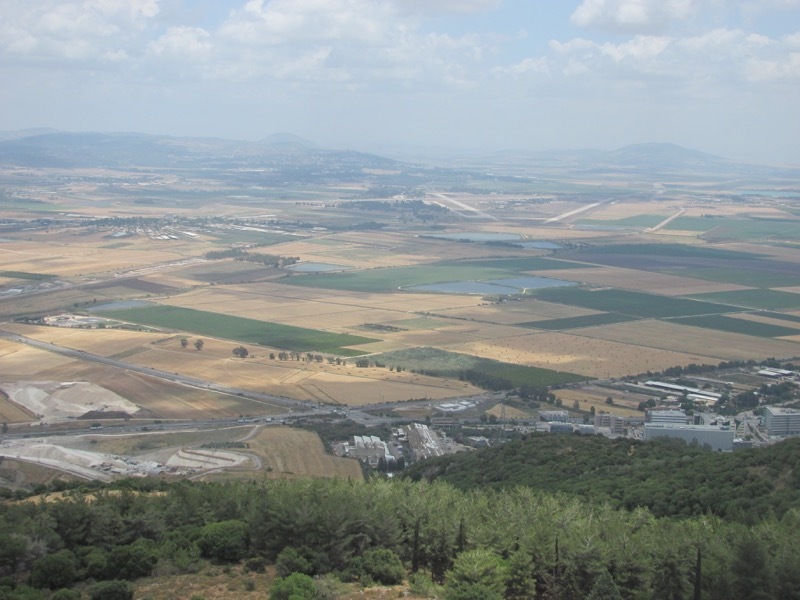 Gilboa, 1 Samuel 31, and the Nazareth Ridge (Luke 1, 4). After our first “falalfel” lunch at a nearby “Druze” restaurant, we drove to Megiddo. This strategically-located city that guarded the primary “route” into the Jezreel Valley is a massive archaeological site with about to dozen “levels” of ruins. It was so important that the Egyptian Pharaoh Thutmose III said, “Capturing Megiddo is like capturing 1,000 cities…”Even King Solomon re-fortified the city (1 Kings 9).We climb to the top of the tell, seeing three different gate structures along the way. We also read Revelation 16 which refers to “Armageddon” (e.g. “har-megiddo” or the “hill of Megiddo”). Our last experience of the day was on the precipice of Nazareth. From here we could look in one direction and see the city of Nazareth today, and look the opposite way and see the Jezreel Valley (and Mt. Tabor, Hill of Moreh, Mt. Gilboa, Mt. Carmel) from this different perspective. We read from Luke 4 (synagogue story) and John 1. We were invited to “come and see” Jesus again in a new and exciting way! Driving to the NW corner of the Sea of Galilee, we checked into Nof Ginnosar, our hotel for the next three nights. We enjoyed dinner together as well as a gathering on the shoreline of the lake itself. What a great first day! This morning we embarked on this new day at 7:40. The weather was very unique this morning, with scattered showers (very unusual for mid-May!). Temps were very comfortable, with highs in the 70s. The skies cleared this afternoon. Driving to the NE corner of the Sea of Galilee and into the Golan Heights, we made our first stop overlooking the city of Bethsaida. We read from Mark 8 (blind man) and John 6 (feeding of the 5,000), with both stories taking place in this area. Continuing to the plateau of this southern Golan area, stopped at Gamla. While unfortunately the road that leads down to the 1stcentury synagogue was closed, we viewed this Jewish city form above. We read from Acts 5 pertaining to an indirect reference to one “Judas the Galilean” was perhaps was from Gamla. 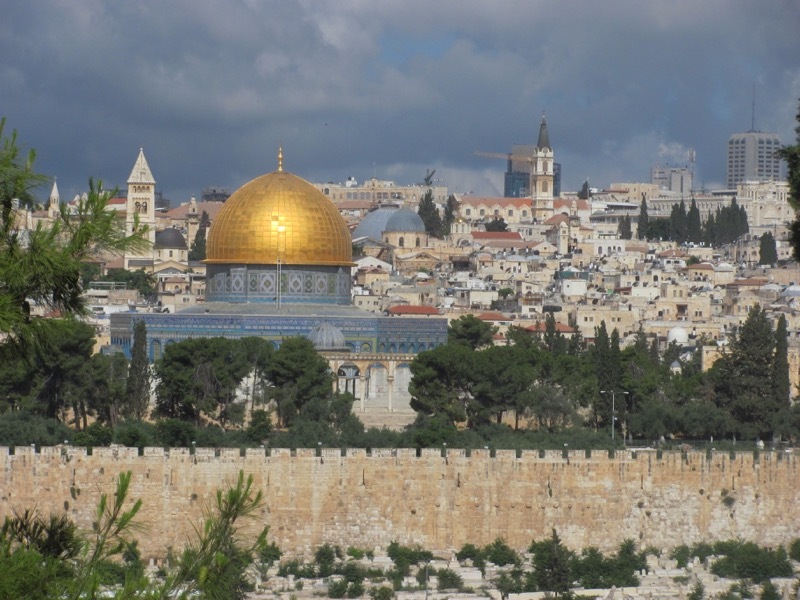 It was here in 66 AD that the 1stJewish Revolt began against the Romans. Close by was the Talmudic village of Qatzrin. Here we saw a reconstructed house of a man called Rabbi Abun.We crowded into this house and read the story of Mark 2 about the paralyzed man who was lowered by friends through the roof. We could see it happening right before our eyes! We also saw another synagogue (4-5thcentury AD). Driving northeast from here, Bental was our next stop. This was an old Israeli military outpost. It played an important role in the 1973 war. We looked across the border into Kuneitra, Syria from here. Shlomo shared some modern history about Syria and the challenges it poses Israel. We saw firsthand how stragically important the Golan Heights are to Israel today to preserve the safety of their citizens. Driving through a few Druze villages and following lunch (at Birhat Ram), Caesarea Philippi was our next site. We read from Matthew 16 before ascending to the grotto area of the site. This was a pagan city during Jesus’ day. But here in the region of this city Jesus asked, “Who do you say I am?” One of the three tributaries of the Jordan is here (called the Banias springs). A little west is Dan, a nature preserve and archaeological site. We walked along the Dan springs (another tributary). We enjoyed Shlomo playing of his recorded. We also read from Psalm 42 and sang “As the Deer” together while listening to the quite sounds of the springs. We walked to the high place of Dan and read from Judges 18 and 1 Kings 12 about the pattern of disobedience displayed here in the days of the Bible. It was here where the Danites relocated from the coastal plain. Leaving the site, we also saw Middle Bronze mud-brick gate. Perhaps Abraham walked through this very gate? (Genesis 14:14). With the clear skies and visibilities, on our way back to our hotel we enjoyed an extra site. Climbing 1,500 feet up the Naftali mountains, we had a spectacular view into Lebanon from the Mishgav Amkibbutz. We looked down to an Old Testament site (Abel Beit Maacah, 2 Samuel 20) and also listened some modern history about Lebanon. Driving back through the Huleh Valley back to our hotel, we enjoyed dinner and a free evening tonight. It was another great day of connecting the dots with Scripture. Today was a perfect weather day, with sun and highs around 80. Leaving the hotel just after 7:30 again, our first stop was Mt. Arbel.While 6 people climbed the trail that leads to the top, the rest bussed through Tiberias and approached the top from the west. 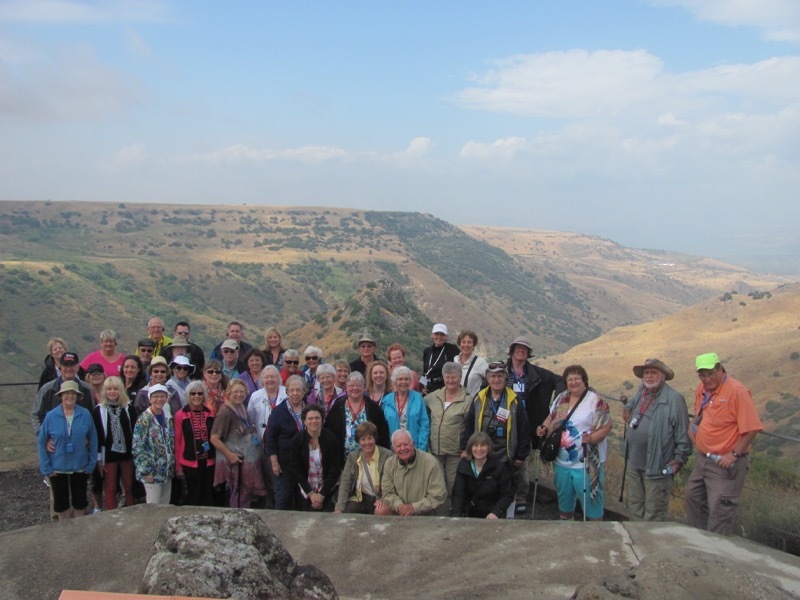 Meeting on top of this 800 foot mountain, together, we enjoyed one of the best views of the Sea of Galilee. Five couples renewed their wedding vows on top too! Driving back down to the Ginnesaret Plain, we visited Magdala. Here we saw another 1stcentury synagogue, one of which Jesus must have taught from. We also enjoyed singing in the newly-built chapel. Next, we drove up to the slopes of the NW corner of the Sea of Galilee to Chorazim. In this ancient city built with basaltic stone, we entered the 3rdcentury AD synagogue. We read from Matthew 23 and listened to the words of Jesus condemning hypocritical lifestyles while encouraging a life of humility. The last stop prior to lunch was Capernaum. It was here where Jesus had his ministry base. While sitting in the 5thcentury synagogue (underneath which is the 1stcentury one), we read from Mark 1,2, & 9, Luke 7, and John 6. It is here where Jesus displayed his “authority” (Hebrew – s’mekah) to so many. We enjoyed a time of quiet reflection on the shoreline. It is here where Jesus called some of His disciples. Driving south to Yardenit, 30 in the group reaffirmed their baptismal vows in the Jordan River. It was a special time for all in re-dedicating our lives to be followers of Christ. Our last experience of the day was the Mt. of Beatitudes. We sat on some rocks overlooking where some suggest the Sermon on the Mount could have taken place. Shlomo read the Matthew 5 text in Hebrew. We then listened to it read in English as we took in the beauty of the lake. We were encouraged to “seek first the kingdom of God” (Mt. 6:33). We returned to our hotel. Some enjoyed a swim on the Sea of Galilee prior to dinner. What a wonderful day here on the shores of the Sea of Galilee! This morning we left the Galilee area and headed south. It was another sunny day, with warmer temps (highs in the upper 80s). Checking out of our hotel, we first stopped at the southern end of the Sea of Galilee at the Kinneret cemetery. Here Shlomo shared about the kibbutz and the life of Rachel, an early pioneer to the land in the early 1900s. Driving south through the Jordan River Valley, we came to Beth Shean. This is a huge Roman site later known as Scythopolis. In this Roman city we saw many mosaics, a bathhouse, the Cardo (main Roman street of the city), the public latrine, and the theater. Some climbed the Old Testament tel for a great view. It was here where Saul’s body was hung after he and his three sons died on Mt. Gilboa (1 Samuel 31). From here we drove through the Hill Country of Samaria. Passing nearby Shechem/Sycar (Genesis 34/John 4), we arrived at Shiloh. The Tabernacle was built here and the Ark of the Covenant resided here for 369 years. We climbed the tel and enjoyed a multi-media presentation of the story of Hannah and Samuel. We walked to the area where it is believed the Tabernacle once stood. We read from 1 Samuel 3, and Jeremiah 7. Continuing south, we passed by Bethel (Genesis 12, 28) and Michmash (1 Samuel 13-14) before driving through the Desert of Perath(a part of the Judean Desert). We read from Jeremiah 13. We also saw a number of gazelles along the way! Finding the main east-west road now, we drove east and descended to the Jordan River Valley and the city of Jericho. After lunch, we climbed the tel. We saw the oldest standing tower in Israel as well as portions of the double fortification wall that was destroyed by Joshua (Joshua 6). We celebrated the historicity of the Bible! We also considered what took place at NT Jericho located about 1/5 miles south (Luke 10, 19, Mark 10). Ascending about 3,500 feet, we drove to Israel’s capital city, Jerusalem! Upon arriving, we checked into our hotel and enjoyed dinner. 10 in the group also enjoyed an optional “orientation walk” to the Western Wall. We enjoyed the special “festival of lights!” It was amazing to see the Old City all lit up with lights! It’s wonderful to be here in Jerusalem! Today was our first full day in Jerusalem. With sun and puffy clouds, great clear visibilities, and temps in the comfortable low 70s range, the weather was ideal. Leaving our hotel after breakfast at 7:35, we drove to the Mt. of Olivesfor our first full view of the Old City and the Temple Mount. We could see the Old city unfold before us. We “connected the dots” between the stories of the Old and New Testaments, especially the life and ministry of Jesus. We first walked down through a Jewish cemetery to Dominus Flavet, a church named after Jesus’ weeping over Jerusalem (Luke 19). Here we also read the “Palm Sunday” story (Luke 19), Acts 1 about His ascension, and Zechariah 14 about Christ’s return. God’s full redemptive plan for the world will be accomplished one day! Walking down to the Garden of Gethsemane, we enjoyed a quiet time of reflection here. We read from Luke 21. It was here Jesus was betrayed by Judas and bound by Caiaphas, the High Priest. Walking from here into the Old City (through Lion’s/St. Stephen’s/Jericho Gate), we sang songs in St. Anne’s Church, a Crusader church. The echo here is about 8 seconds long. We also read from John 5 here overlooking the Pools of Bethesda. Next, we walked along the Via Dolorosa, the traditional “Way of the Cross.” This lead us to the Church of the Holy Sepulcher. Following lunch in the Christian Quarter of the Old City, we walked out of the Jaffa Gate and got picked up by our bus. Driving south and east of Jerusalem about 8 miles, we arrived at Herodium. This was a palace-fortress built by Herod the Great. He would be buried here (4 BC) after he died in Jericho. We climbed this “artificial” mountain. From here we could clearly see the towers of the Mt. of Olives, Bethlehem, and even the Dead Sea beyond the Judean Desert to the east. Driving into Beit Sahour outside Bethlehem, we enjoyed a time of reflection and singing in one of the caves of the Shepherds’ Fields. We rejoiced that “just at the right time, God sent His Son…” (Gal. 4:4). We also enjoyed the great acoustics in the Chapel of the Shepherds. Before driving back to the hotel, we stopped at an olive wood shop/store in Bethlehem. We enjoyed a time of shopping here. Arriving back at the hotel, we enjoyed dinner and a free “Erev Shabbat”(evening of the Sabbath). Another wonderful day! Today was a “desert day!” Leaving our hotel after breakfast, we drove to through the Judean Desert to the east before turning south along the western coastline of the Dead Sea. Our first destination was Masada. The weather was very nice again, with sun and highs in the 80s. Masadawas yet another palace-fortress of Herod the Great. It was built on a “stand-alone” mountain that reaches about 1,000 feet above the visitor center below. We ascended Masada in a cable car. Shlomo shared with us the story of how 967 Jews died here top as the Romans surrounded them for nearly three years. We saw the one of the palaces, the Roman ramp, cisterns, the casemate walls, the synagogue, and the bathhouse. A few in the group hiked down the Snake Path at the end of the tour of this amazing place. Praise God that He is our metzada (our fortress, our “Masada”)! Driving north now about 20 minutes, our next stop was Ein Gedi. We walked into the canyon (“Wadi David”) and enjoyed the narrative of Ecclesiastes 1 and the stories of 2 Chronicles 20 and 1 Samuel 24. This later story preserves David’s experience of hiding in a cave here when Saul was pursuing him. We walked back far enough to see some of the water falls. From here we enjoyed floating in the Dead Sea. This is a body of water that is about 30% salt and mineral. Everyone enjoyed it very much! On our way back to Jerusalem, we made a brief stop overlooking the Wadi Qelt. With the Judean desert as the backdrop, we heard the powerful words of Isaiah 40 (“A voice of one calling in the desert…”), while Shlomo sang “Psalm 23.” The overview of the Judean Desert was special! We returned home to the hotel for dinner. Some enjoyed a walk to Ben Yehuda Street and Jaffa Road for some shopping and a taste of modern Israel culture. Today was another perfect weather day, with sun and temps in the 70s. Our first visit of the day was to the famous Western Wall (also called Wailing Wall). We arrived in time for morning prayers. Many Orthodox and Ultra Orthodox Jews covered themselves with their tallit (prayer shawl). Exiting this “tunnel,” we returned to the Western Wall and climb the steps to the heart of the Jewish Quarter. Here we enjoyed listening to Moshe an Orthodox Jew who shared about His Jewish faith. We also enjoyed his shop (“Shorashim”). After some free time and lunch, we walked out of Zion’s Gate to meet our bus. Driving to western Jerusalem, we visited the Israel Museum. Here we saw a 1:50 scale model of 2ndTemple Jerusalem (NT period). We also walked through the Shrine of the Book (to see some of the Dead Sea scrolls) and the archaeological wing of the museum. Leaving the museum, we next visited Yad Vashem, Israel’s Holocaust Memorial & Museum. We heard Shlomo share his personal story (he lost a total of 12 family members in Vilna, Poland). We also walked through the Children’s Memorial and the museum itself. It as quite a moving experience! On our way back to the hotel, we made a brief visit to the 9-11 Memorial. Arriving back to the hotel, we enjoyed dinner as well as another optional walk. Today was our last day here in Jerusalem! With the sun and nice temps greeting us again (low 80s), we left the hotel and headed straight to what today is called Mt. Zion.We first visited the grave of Oscar Schindler, the German who saved 1,200 Jewish lives during the Holocaust. He is buried in a Catholic cemetery. In walking distance is the traditional House of Caiaphas, the High Priest during the days of Jesus. The church here is called Galicantu (the church of the “crowing’). We read from Luke 22 and Psalm 88 about denial of Peter and the crowing of the rooster. Jesus spent a night under Caiaphas’ watch before being handed over to Pontius Pilate. Just to the east is the City of David.This was the city of Jebus that David captured (2 Samuel 5). After seeing the area from an observation platform and watch a 3D movie about the City of David, we descended down through the excavations. Dr. John dug here back in 1982. We could see part of David’s palace as well as other house structures further down the eastern slope of the city. We also saw Warren’s Shaft, originally thought to be (but no longer held) to be the “shaft” up through which Joab (David’s general) infiltrate the city. We also remembered the story of 2 Kings 20/2 Chronicles 32 as well, as Hezekiah re-fortified the walls of the city and cut out of rock a 1,720 foot water tunnel when he learned of the Assyrian approach to the city. As we made our way down to the Gihon Spring, about half in the group walked through the water tunnel while others walked through the “dry” Canaanite tunnel. Both groups converged at the Siloam Pool where we read John 9 in dramatic form. This was where Jesus sent the blind man to be healed. We also sang a song here and prayed for healing. Before lunch in the Jewish Quarter we visited the southern wall excavations of the Temple. Here we saw the huge Temple stones on the Roman pavement (brought down in 70 AD), “Robinson’s Arch,” and the pinnacle of the Temple. On the Temple steps we remembered all the stories related to what happened here (Luke 2, 18; Mark 12, 13; John 10; Acts 2, 4). We felt privileged to walk up the very same Temple steps as so many before, including Jesus! We ended the day with a very special Communion Service at the Garden Tomb. This is one possible location for both the crucifixion and burial site of Christ. We rejoiced in the power of the resurrection! We returned back to the hotel for our farewell dinner.It was a great time of fellowship! We retired early since the flight home is at about 5 a.m. tomorrow morning. We plan to get up early for the drive to the airport. What a wonderful trip this was! Praise be to God! We arrived back to the States. The end of a great trip!